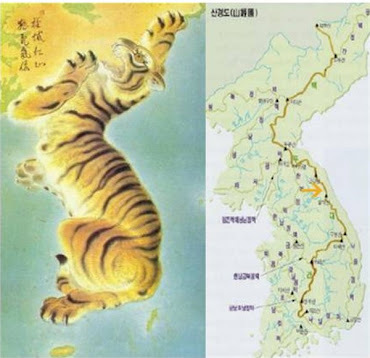 This section sees the Baekdu-daegan cross from Gyeongsangbuk-do into Gangwon-do. Along 23.7km the trail passes over 5 peaks; Guryeong-san, Shinseon-bong, Gitdaebaegi-bong, Buso-bong and most notably the great Taebaek-san. It also passes Yooil-sa on the north east slope of Taebaek-san, which to my knowledge is the only case in which the track passes directly past a temple. Doraegi-jae pass is crossed by highway 88 between the small town of Seobyeok to the SE and Yeongweol NW, Seobyeok is about 5km downhill and after the long lonely walk to the pass could be a good option for warm food and cold beer. There appears to be camping and water 5ometres or so north up the road on the left. There is also a pagoda for shelter. The track leaves Doraegi-jae and runs east up a steep slope fo 15mins or so before reaching the ridge, five minutes or so along the ridge is an iron tower (purpose unknown) and roughly 15min later is crossed by a small mountain road (임도??) according to my map it only runs a few hundred metres in each direction. From here the trail turns to a NW direction toward an unamed peak of 920m continuing to a second peak of 985m. Between the two peaks are quite a number of Azalea trees which I imagine look fantastic in the early summer. A short distance from the second unamed peak are two helipads, from here the track goes slowly downhill and after 2ominutes reaches another helipad and deadend mountain road crossing the ridge. It is clear that the left hand side of the ridge in particular is a military area. From this second Imdo the track continues very steeply NE turning direct North to a 1256m peak (about 30min) and then turns east toward Guryeong-san (1345.7m). Between the two peaks are a number of large rocks to the right of the track. Guryeong-san accomodates another helipad and thus has a bald peak which offers good views of surrounding peaks. To the east is Shinsan-bong, northeast you can see Gitdaebaegi-bong, Taebaek-san and Hambaek-san in good weather, the next four peaks on the trail. From Guryeong-san the track widens to a fire-break line running steeply SE to Gojik-ryeong pass, a secondary trail from Seobyeok village meets the ridge here, 100 metres down this path is an altar where travelling peddlers would stop to pray for an incident free journey when delivering their goods. According to my translator/researcher worship is still held at this altar Apr14th of the lunar calendar every year. The Baekdudaegan trail continues from this intersection along the fire break to a peak of 1231m and down to Gomneomi-jae, from this pass there is a track to the right running down to Shildu dong and Jinjo dong of Aedang-ri. At Gomneomi-jae is a small bungalow, im not sure if staying there is possible though. From the pass the track shifts from SE to head north, there is another helipad and the firebreak ends, at the end of the firebreak is a good spot for camping. From here to Shinseon-bong peak is 20 minutes of steep slog to yet another helipad, the track turns to head SE again descending from from Sinseon-bong along the ridge. 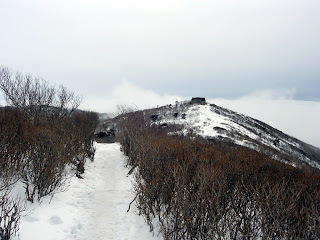 After 30-40 minutes of easy ridge walking is a three way intersection (삼가리), where the ridge breaks into northern and southern arms, to the right a secondary trail runs along the southern arm to Gakhwa-san (1176m), while the Baekdu-daegan trail follows the left ridge, turning north into Taebaek-si (city). At this junction water can be found off the left of the track, from a spring feeding the Chunshiri-gol stream. Half an hour north of the intersection is a 1174m peak, from here you can see Shinseol-bong to the west and the next peak Gitdaebaegi-bong, an hour north east. 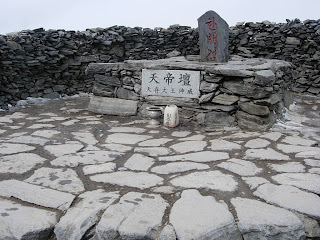 After descending the ridge from the peak for 10minutes there is a large pine tree where it appears people have rested or possibly camped, water is available on the left of the track from another spring feeding the Chunshiri-gol and probably to the right as well from the Jangbawi-gol. From this spot there are two tracks, one which continues along the main ridge line toward Gitdaebaegi-bong and another which heads in the same direction left of the main ridge line, they both meet up near Gitdaebaegi-bong. 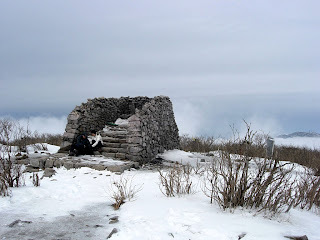 I took the main ridge track and was glad I did as there are a lot of Royal Azalea trees (철쭉) along the ridge. Gitdaebaegi-bong (1370m) is reached after about 45 minutes, from the peak a trail goes right, south east to Duri-bong and down to Hyeon-dong, while the Baekdu-daegan trail continues north toward Buso-bong in Taebaek-san provincial park. Gitdaebaegi-bong to Buso-bong is a good 2 hour hike along the ridge line. About half an hour into the walk you see the first Jumok-namu, a woody alpine tree of the Yew family. 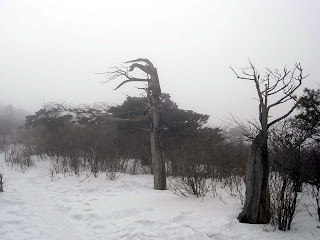 These trees are only found on the higher slopes of korean mountains, most famously on Taebaek-san where they are found in the greatest numbers. To Buso-bong peak are two trails, one following the ridge line and another on the western side of the ridge. Buso-bong (1546.5m) is named Muswi-bong on most maps. I've used Buso-bong here as that's how its named in the map I was following. A friend told me Buso-bong is named after Buso wang, son of Dangun the mythical first king of Korea. 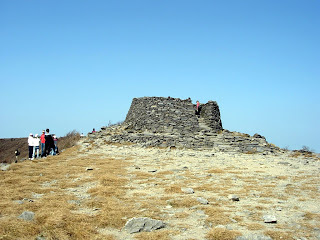 After descending from Buso-bong the Baekdu-daegan joins the main ridge of Taebaksan Provincial park between Cheonje-dan (north-west), and Munsu-bong (north-east). The trail becomes wider as it enters this popular hiking area and heads north-east through highland forest dominated by azalea trees, to Cheonje-dan, 30 minutes away. 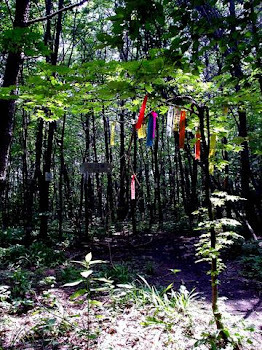 Reaching Cheonje-dan (Altar for offering to heaven) evokes a feeling of arriving somewhere special. For information on Cheonje-dan and all things Taebak-san go to David Masons' excellent Taebaek-san page. 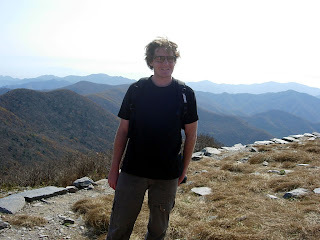 The views from Cheonje-dan are 360 degress and on a clear day, spectacular. Looking south, south-west you can see a great stretch of the Baekdu-daegan, including all of the peaks I walked in this section, and follow the subsidary ridge lines breaking off the Baekdu-daegan like willow roots (see top photo), if lucky you may also catch a glimpse of Cheongryang-san almost due south. To the east is rocky Munsu-bong and north Hambaek-san. A track runs east off the ridge down to Manggyeong-sa temple. A spring flows at the temple all year round with a sign proudly claiming it as the finest water in all Korea. There is also a small store at the temple serving ramyeon and hot coffee; definitely worth the 5minute detour for any through walker. Taebaek city hold a royal Azalea festival here every June. From Janggun-bong its all downhill to Youil-sa. After half an hour or so the trail reaches an intersection, to the left is a small cable car which takes supplies down the ridge to some kind of building(? ), to the right is a 4WD track from which those supplies are driven from Highway 31, and straight ahead, just around the corner is Youil-sa temple. Water is available at Youil-sa from a spring in the garden. The trail continues along the ridge past Youil-sa, and narrows as you leave the popular Taebak-san tracks. 30-40 minutes after leaving Youil-sa the trail steepens toward an 1174 metre rocky peak, from here it curves north and descends to Sanryeong-gak, a small pagoda built by peddlers crossing the pass in times gone. Worship is still held here on April 15th of the Lunar calendar, interestingly the day after it is held at Gojik-ryeong, near where I started walking. Of course nowadays any traffic crossing Hwabang-jae pass uses Korean state highway 31, a further 10 minutes down the trail, which is where my walk ends. The pass is an obvious point for a rest, I couldnt see any natural source of water but refreshments of all kinds can be bought at the Apyeong service centre. Me on Taebaeksan Autumn 2006.